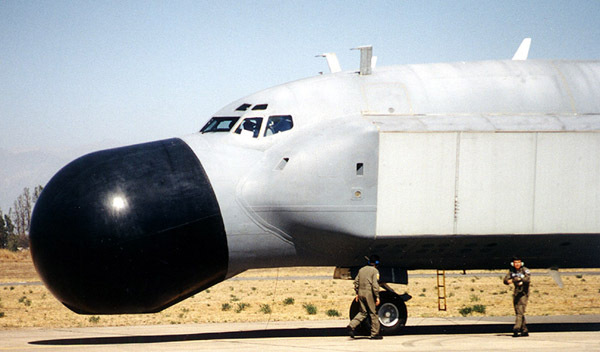 A Boeing 707 airframe provides the PHALCON with sufficient capacity for equipment and crew. A typical configuration includes up to 11 operator consoles. The Boeing 707 has excellent endurance, and can remain on station for extended periods. Still another advantage is the high cruise altitude which gives a long surveillance range of zero altitude targets. Each operator work station has a large graphic high-resolution, display for advanced system control. A New Generation AEW Platform: The long-range, high performance, multi-sensor PHALCON AEW introduces a new level of performance to airborne early warning, tactical surveillance of airborne and surface targets, and the gathering of signal intelligence. Unique Integration of Sensors: The PHALCON's four sensors are : Radar, IFF, ESM/ELINT and CSM/COMINT. Radar: A radar with conformal phased array antennas for simultaneous coverage and instantaneous focus on selected targets. The PHALCON advanced radar has several conformal phased array antennas. They are mounted on the fuselage of the aircraft and can provide up to full 360 coverage. · Selectable surveillance: Surveillance can be limited to the battle zone and other areas of interest. The scan rate in these selected areas is much higher. · Optimized detection and tracking: A special mode for maneuvering and high value targets employs a high scan rate and beam shapes optimized for each target to ensure tracking performance. · Fast track initiation and no false alarms: Verification beams sent at specific, individual, newly detected targets Track initiation is achieved in 2 to 4 seconds. eliminate false alarms. · High Fault Tolerance and Redundancy: The system uses distributed, solid state transmitting and receiving elements. Each element is controlled in phase and amplitude. The system continues its operation even if some of the units are faulty. Advanced IFF employing solid state phase array technology. The PHALCON IFF system implements interrogation, decoding, target detection and tracking using the standard modes. Azimuth measurement is carried out by monopulse processing. The IFF antennas are incorporated in the primary radar array and are coordinated with the array to avoid mutual interference. Similar antenna elements and transmit/receive modules are used for both the radar and the IFF. The PHALCON's advanced ESM/ELINT system is fully integrated with the radar and other sensors, serving as one of the most important elements of the identification process. It is designed to operate in very dense signal environments, providing simultaneous 360 coverage. The system uses narrow-band and wide-band receivers to provide very high sensitivity and high probability of interception of airborne and surface emitters. High bearing accuracy for all received signals is achieved through Differential Time of Arrival (DTOA) measurements. The system also collects and analyzes ELINT data. Tuned in to airborne, ground and shipborne transmissions. The PHALCON's CSM/COMINT receives in UHF, VHF and HF, rapidly searching for airborne, shipborne or ground communications signals of interest. Selected radio nets can be monitored for signal activity. A DF capability locates targets. Detected signals can be assigned to monitoring receivers instantaneously. 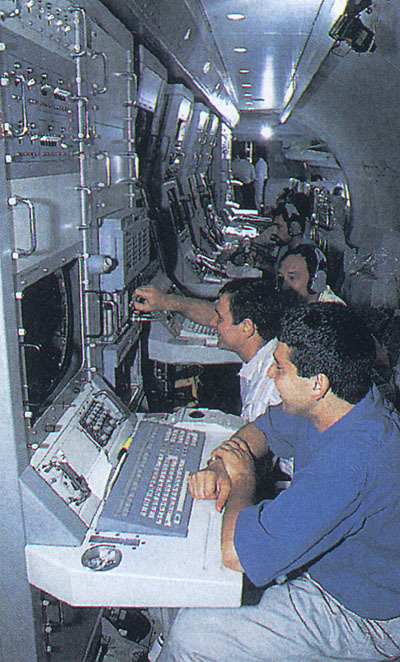 The system makes extensive use of computers to reduce the load on operators. The long-range, high performance, multi-sensor PHALCON AEW introduces a new level of performance to airborne early warning, tactical surveillance of airborne and surface targets, and the gathering of signal intelligence. The PHALCON four sensors are: radar, IFF, ESM/ELINTand CSM/COMINT. A unique fusion technique continuously cross-correlates data generated by all sensors; this data is combined with an automatically initiated active search by one sensor for specific targets detected by other sensors. A Boeing 767 is a modern airframe that provides the PHALCON with sufficient capacity for equipment and crew. A typical configuration includes up to 11 operator consoles. The Boeing 767 has excellent endurance, and can remain on station for extended periods. Still another advantage of this aircraft is its high cruise altitude which gives a long surveillance range of zero-altitude targets. The PHALCON systems can be installed on other platforms, such as: Boeing 767, Boeing 747, Airbus and C-130. The Condor is a modification of the well-known Boeing 707 for the Airborne Early Warning role (AEW) designed by the companies IAI and Elta, of Israel. 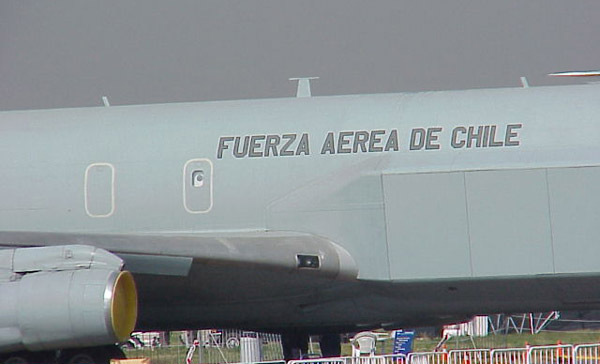 The plane started its development in 1990 and the prototype, built for Chile's Air Force, made its first public showing at the Paris Air Show in 1993. IAI named it Phalcon , but in Chile it is known as the Condor and FACH has assigned to it the serial N° 904. India and Israel signed an agreement in January 2004 on the sale of three Phalcon early warning radar systems worth $1.1 billion. Russia and Israel on Oct. 10 signed a tripartite agreement to facilitate the equipping of the Indian Air Force (IAF) with the Phalcon airborne warning and control systems. 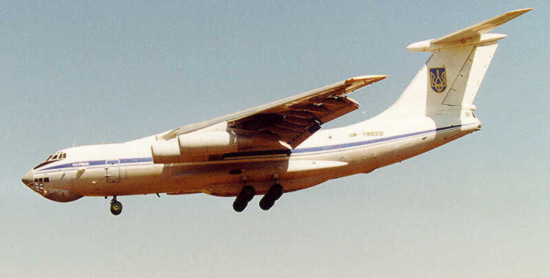 The IAF plans to mount the Phalcon radar and surveillance systems from IAI on IL-76 aircraft supplied by Russia.